did their 2nd Pioneer trek. walking 26 miles over 3 days. This time I was on the other side. and reliving every moment with them that I had experienced. I was supposed to walk the trail with them again with my dad to help video everything. My ankle apparently wasn't ready for such an ordeal. I wasn't able to walk it like I wanted to. and helped my mom with stuff. 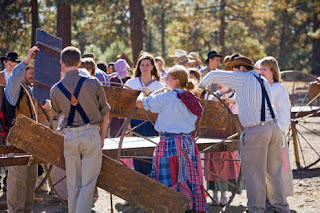 You start with 200 youth dressed as pioneers of old. Give them a "Ma and Pa"
and divide them into families. of rock and dirt uphill and downhill. Give them a "pep-talk" speech and send them on their way. water, food, and supplies they had brought with them. The first day is by far the hardest. There is a place called "Rocky Ridge"
well, it's called that for a reason. Steep rocky inclines that are tricky and require everyone to help out. These kids proved their mettle and toughness on this journey. step by step, holding the baby (doll) his family had been entrusted with. "Just gotta keep walking. One foot in front of the other." and sadness that we couldn't go help him. many tears were shed as they saw all of the staff there to greet them and welcome them to Zion. some of the kids went back out to greet the other companies as they came. One of the sweetest girls in my home ward went and threw herself on another sweet girl in our ward when she saw her coming. They cried and hugged and said "We did it!" It touched me to the core because I remembered feeling like they did. that I had done the 26 miles and lived through it. 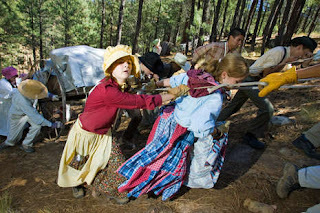 and the girls are left to themselves to push the handcarts up a hill. The strength of these girls was incredible. as one girl starts to scream and cry for water. they just didn't think it would be but it was. angels appear dressed in white to help the women pull the handcarts up the hill. and the most humbling experience of my life so far. "Don't worry, I got this for you"
and I cried like a baby with gratitude and thanked my Heavenly Father for that wonderful man. and the same sentiments were heard. "That was so hard. But I did it. Now I know I can do hard things." This was the coolest thing for me to be able to do and be a part of. That reminded me of so many things I had forgotten about the trek I went on. Thank you for sharing. That's awesome! :D I'm glad you got to experience it (kind of) again. It reminded me of my trek... I wish I had gotten to experience the angels. We had them, but none of them came and helped my handcart. :( It's an amazing experience, though.